Kordz PRS3 HDMI cables are ultra-reliable hybrid fiber/copper cables engineered for in-wall use. 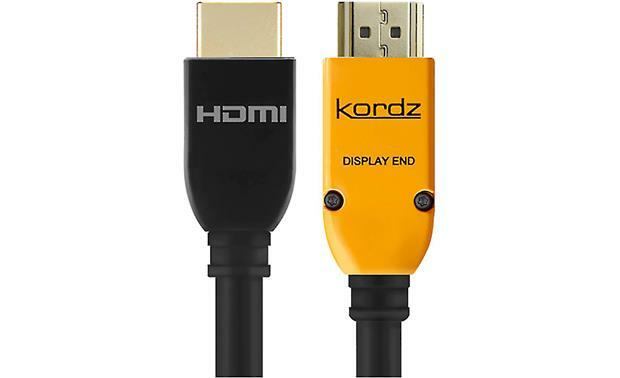 Kordz PRS3 HDMI cables are ultra-reliable hybrid fiber/copper cables engineered for in-wall use. 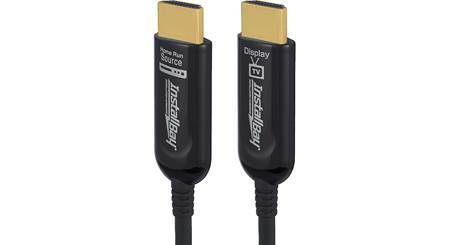 Though thin and lightweight, PRS3 cables support the maximum 18 Gbps bandwidth provided by the HDMI 2.0 standard. Kordz PRS3 supports the latest advances in video technology, including 4K Ultra HD and HDR content. Unlike conventional copper-based HDMI cables, these hybrid cables divvy up the signal-carrying duties among four fiber optic conductors and several copper conductors. The other advantage of these cables is the "active" part — the built-in signal processing chip. 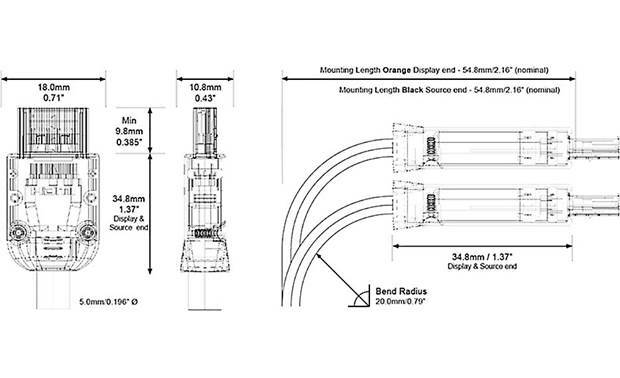 It helps ensure that your signals travel from source to display with no loss or interruption. The cable is self-powered, drawing 5V via the HDMI connection to the source device, so no external power is needed. Kordz PRS3 hybrid cables are extremely flexible, with a bending radius of just 20mm that allows connections in tight spaces. The full metal die-cast shell assembly and unique grip tab HDMI connector are ideal for fixed installs — these cables are not recommended for repeated plug/unplug use. The color-coded connector ends eliminate installation error (there's only one correct way to hook them up). AOC HDMI Cable: The PRS3 AOC HDMI by Kordz is an active fiber optic HDMI cable that also uses copper conductors. This ultra-reliable cable is both secure and simple to install. Light, thin and flexible, AOC HDMI is suitable for all installations where long length and high bandwidth is required. The PRS3 AOC HDMI cable can deliver 4K UHD/HDR video for a dependable high-quality signal distribution solution. DPL Labs Certified: The PRS3 active fiber optic HDMI cable is certified by DPL Labs. DPL Laboratories, Inc. are experts on high-band- width digital signaling solutions. The respected DPL 4K Product Certification Program is designed to combat the fears of cable and display manufacturers and end users alike. The 18Gbps maximum HDMI 2.0 certification from DPL Laboratories ensures that the cable delivers on its performance promise. HDMI 2.0/18Gbps: This active fiber optic HDMI cable is HDMI 2.0 certified and supports the ultra high speed 18Gbps bandwidth for 4K UHD and HDR video with 4:4:4 color subsampling, as well as high resolution multichannel audio. It is also HDCP 2.2 compliant. 4K UHD + HDCP 2.2: PRS3 AOC HDMI supports resolutions up to 4K@50/60Hz (2160p), which is 4x the clarity of 1080p/60 video resolution, for the ultimate video experience. With stunning 4K UHD resolution (3840 x 2160) detail is strikingly sharper. HDCP 2.2 fully complies with the latest copyright protection standard for 4K video transmission. 4:4:4 Color Subsampling: It also supports RGB, YCbCr 4:4:4, YCbCr 4:2:2, and YCbCr 4:2:0 color subsampling. With 4:4:4 color subsampling, luminance (brightness) and chroma (color) are sampled at the same rate; resulting in an RGB color palette as big as the video sampling rate for a video image with more colors, plus greater color accuracy and detail. Multichannel Audio with ARC: PRS3 AOC HDMI supports lossless high resolution multichannel audio - including Dolby Atmos, Dolby TrueHD, DTS:X, and DTS HD. It also supports ARC (Audio Return Channel) which allows an HDMI-connected TV with a built-in tuner to send audio data "upstream" to a surround audio system, eliminating the need for a separate audio cable. Quality Construction: The PRS3 AOC HDMI cable uses both fiber and copper conductors. It is outfitted with a zinc-alloy, slim-profile, anti-vibration connector shell that allows for easy installation and fits within 1" conduit. The cable's Kevlar-reinforced internals allow for superior flexibility and pull strength during installation; the cable is also lightweight and flexible making installation easier. And, its strong 1Kg grip ensures the connector stays in place for as long as required. The cable's low smoke zero halogen (LSZH) jacket is fire-rated and offers safe in-wall installation. Directional HDMI Connectors: The active fiber optic HDMI cable is terminated by a standard full-size HDMI connector on each end; these HDMI connectors are directional. The Black HDMI connector plugs into your source device, while the Orange HDMI connector plugs into your display device. The Orange HDMI connector is also labeled "Display End". The HDMI connector pins are Solid OFC and gold plated for maximum signal transfer. Power Requirements: The PRS3 AOC HDMI cable does not require additional power, further simplifying integration and installation. Instead, it receives power through the HDMI connector's "Hot"-pin at the source device. 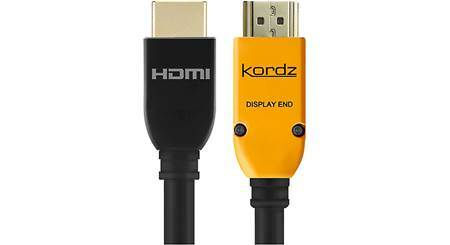 Searches related to the Kordz PRS Series 3 Active Hybrid HDMI Cable "High Speed" hybrid fiber/copper HDMI cable.